Good evening from a wet and miserable London. Monday is always a tricky day to deal with. For many of us, it’s the first day back at work after a restful, relaxing weekend with loved ones. For some, it might be the 1st time you’ve seen daylight in 2 days, in which case, welcome back! ( we won’t ask what you’ve been doing, a Gentleman or Lady of Leisure should never tell) Either way, if you’re anything like me, you wouldn’t have been too happy at the sight of constant rain falling on your window and taken it as a sign for the day ahead. Well fear not dear readers! Woo Long Talks is here to save your Monday! 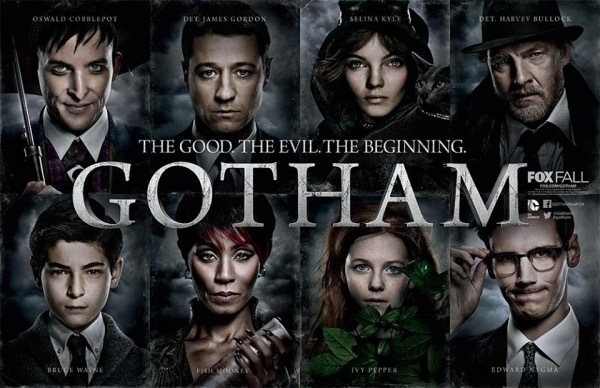 We also have the UK debut of the much anticipated Gotham TV series. I got the opportunity to watch the 1st episode today, so I thought I’d share with you my thoughts and initial reactions. Some mild spoilers ahead!!! When FOX announced on the 24th of September 2013 that they intended to bring to the small screen a show about Batman’s home town of Gotham, to describe the reaction amongst the nerd community as ‘excited’ would have been some what of an understatement. With no live action TV show dealing with anything relating to comics most popular character since the 1968, enthusiasm reached ‘Fever Pitch’ levels. As more details about the show’s plot began to emerge, some of the initial buzz was tempered by the news that the show would focus primarily on a young James Gordon battling organised crime and corruption at the highest levels of Gotham’s justice system. However, the introduction of Bruce Wayne as a young boy, along with several other hints that other key Batman characters would be introduced, saw a steady rise in interest once more. So, after the initial anticipation, did the pilot episode live up to the hype? Well, I feel it’s got off to an encouraging start. The opening sequence featured the introduction of Selina Kyle (Camren Bicondova) who fans of Batman will recognise as Batman’s long term villain/love interest Catwoman. She is given no dialogue in the scene or throughout the episode, which feeds of into the air of mystique surrounding her character. The murder of Thomas and Martha Wayne is deftly handled by director Danny Cannon, in spite of being a story that many fans are well familiar with. The introduction of James Gordon (Ben McKenzie) and his partner Harvey Bullock (Donal Logue), sets up the tone for the relationship and their importance to the story. Gordon is young and idealistic, determined to use his position as detective to clean up Gotham’s crime and corruption problems. He’s an earnest man and McKenzie handles this side of his character well. Bullock is a seasoned, cynical veteran who has adopted to the ‘way things are done’ and sees any attempt to change this as futile and dangerous. It’s later revealed that Bullock is under the employ of organised crime boss Carmine Falcone (John Doorman) and this will no doubt lead to future conflict between the two men. We are also introduced to Fish Mooney (Jada Pinkett-Smith), a ruthless, ambitious mobb boss currently under the command of Falcone. Mooney clearly is unhappy with her current role and views herself as the would-be Queen of Gotham’s underworld. It’s refreshing to see a woman and a woman of colour within a villainous role and Pinkett-Smith clearly revels in the fun of playing a ‘bad guy’. We are also introduced to Oswald Cobblepot, an underling of Mooney’s with plans to carve his own piece of the criminal pie. Played with aplomb by Robin Lord Taylor, Cobblepot is both sympathetic and vicious, he is easily the class act of the episode and surely a star in the making. Again, Bat-Fans will no doubt recognise the character’s name and throughout the episode, Lord Taylor more than lives up to expectations. It will be fascinating to see just how this character develops and lives up to the expectations of fans. Edward Nygma also makes an appearance as a corner who seems to enjoy riddles and a host of other recognisable characters make cameo appearances. The story progresses swiftly as Gordon and Bullock investigate the Wayne’s murder, and the direction, pacing and character development all reflect this. Bruce Wayne (David Mazouz) is portrayed as a lost little boy trying to understand the tragedy that has befallen him and his family’s butler, Alfred Pennyworth (Sean Pertwee) is forced to become a surrogate father to youngster, a role he seems to struggle with. The Art Direction for the show is particularly impressive, lending an authentic feel to the city of Gotham and it’s inhabitants. As the episode heads towards its climax, secrets are reveled that add further intrigue; Who is truly behind the Wayne’s murder? How far does Falcone’s influence truly go? When will Mooney ‘make her play’ for power? What is the nature of the relationship between James Gordon’s fiancee Barbara Kean and Detective Renee Montoya of Gotham’s Major Crimes Unit? There’s certainly enough there to keep me watching for the next 13 episodes, so let’s hope the series builds on this steady start. I personally am looking forward to seeing how Cobblepot and Mooney eventually ‘cross swords’ but i’d love to get your thoughts on the show. Have you been impressed so far, or has the show disappointed you in any way? Let us know your thoughts in the comments below! Next Next post: The Afternoon After The Night Before..